Heavyocity's Evolve is packed full of all kinds of high-quality sonic weirdness and looks set to become a popular tool for anyone involved in soundtrack work. Listen closely to film or TV music and then try mentally stripping away all instruments with an obvious name: electric guitars, cellos, drums, bloody Uilleann pipes... You'll typically find that this leaves quite a lot to be accounted for, especially where the music concerned carries any element of suspense or mystery — ethereal background washes, pulsating synthetic drones, slithering metallic swells, and unnerving distant chants are just some of the sounds that regularly serve for scene-setting and punctuation purposes. Although even the most common of these sounds are arrived at in rather odd ways, they are the stock in trade of professional composers of music to picture, and you're unlikely to get far from the starting blocks without a good collection of them to call on. Which is where Heavyocity's new Evolve comes in, delivering 6GB of exactly this kind of ear candy in a tidy Kontakt 2 Player format. It is the brainchild of experienced media composers Dave Fraser and Neil Goldberg, who have produced music for industry heavyweights such as Sony, Gillette, Pepsi, MTV, VH1, NBC, Discovery Channel, Sci-Fi Network, Activision and Obsidian Entertainment, to name only a handful. Installing the single DVD is the usual opportunity for a swift pint, and requires a challenge-and-response-style registration procedure via Native Instruments' web site. You can do this on a separate machine if your studio computer, like mine, has no Internet connection. Evolve's content comprises a number of families of sounds. The Rhythmic Suites are sliced rhythmic loops that will automatically sync to the Player's global tempo setting or the tempo of a host sequencer. The Percussive Kits and Stings & Transitions families both feature banks of one-shot samples, while the Tonality & FX section focuses on more melodic and pad-like instruments, as well as lots of evocative special-effect phrase samples. The very selling point of this kind of library, namely that it provides loads of sounds that are difficult to classify, presents something of a problem when it comes to categorising and organising the library content within each of these families. Sensibly, Heavyocity have paid careful attention to descriptive patch naming. Obviously, in some cases the identity of the source sampled provides a mental hook on which to hang the sounds — although some of the sounds in the Uncaged Piano and Toolshed & Warehouse categories are pretty way-out, the categories do at least give a basic idea of what sonic territory you might expect to be covered, and also make it easier to relocate favourite sounds once they're discovered. Other categorisations take a practical slant, such as flagging the presence of tonal elements (things like chords and drones) within the samples that may need to be aligned with harmonies in your other instrumental parts. The difference between the Percussive Hits and Stings & Transitions sound-families, on the other hand, is primarily defined by the samples' amplitude envelopes, with the latter group featuring slower attack and release characteristics in general, which is a useful, if slightly fuzzy, distinction. Another great thing is the way in which some of the patches have been perceptively named to trigger strong mental images closely fitting the sound in question. You can take a pretty good guess at what patches like 'Vapor Freeze', 'Glasteroids', 'Whaling Wailing', 'Creep-out Builds' and (a personal favourite) 'Alien Guitar Womb' sound like just by the names, and it's also surprising how accurately the patches deliver that imagined sound when you actually audition them. Clearly, the task of describing these sounds presents similar problems for the reviewer. However, one of the great things here is that Evolve's samples are not only dripping with character, but also nail many, many film and TV clichés, which means that most things you play immediately bring to mind the kinds of film and TV scenes they typically accompany. So I'll try to give a sense of the scope of Evolve through references to those. 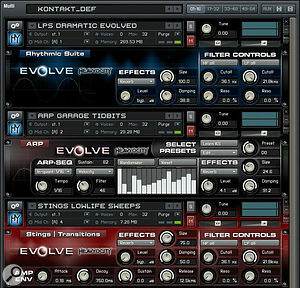 Here you can see the different sets of controls available to the various patches within Evolve, chosen to suit the specific characteristics of each family of sounds.If you're after blockbuster pursuit music, look no further than the Looped Percussives subset of the Rhythmic Suites — set a couple of loops going, load up VSL Epic Horns, and watch out for orcs! Whether your hero happens to be escaping from hordes of spear-throwing natives or a single indestructable automaton, there's more than enough material here to fit the bill. Other, more subdued loops might accompany those gratuitous weather forecast animations, or else add background tension to the otherwise mundane sight of a white-coated forensic protagonist peering into her microscope. Also on offer here are the kinds of pulsating distorted backdrops that so often seem to accompany acrobatic images of immaculate dreadlocked physiques when Japanese companies are advertising small mass-produced cars or electronic gadgets. All the loops are in 4/4 time and without any swing, and although this might seem restrictive in some libraries, here it could be seen as merely an admission of mainstream reality. And, of course, the advantage of this metric restriction (in conjunction with Kontakt Player's automatic tempo-matching) is that it's a piece of cake to mix and match material. Keyboard mapping of the loops has been sensibly structured to improve usability, so rather than just assigning loops at random to the keys, Heavyocity have first put the most full-range loops at the left-hand extreme of the keyboard, and have then ranged their constituent rhythmic layers to the right, following a kind of pitch order that's very intuitive — booms and woofs on the left, working across to the glitches and twinkles on the right. Not exactly rocket science, but this approach significantly cuts down how many loops you have to audition when you're looking for something to fit a specific pocket within your arrangement. Because you're likely to want to shift the pitch of the Looped Tonals loops to match your composition, Heavyocity have spread out only a handful of the tonal loops across the keyboard in each patch, so that each one has at least an octave of pitch control. This makes it a bit tricky to surf lots of different tonal loops in a hurry, though, so the designers have also programmed a 'menu' patch that ranges all the tonal loops across the keyboard one note at a time, and all pitched to 'C'. Another different texture of rhythmic backdrop is provided by the other two sections of the Rhythmic Suites, which again offer percussive and tonal loops, but this time under the control of a 16-step sequencer with independent controls for note velocity, pan and filter cutoff. Pitch control here comes courtesy of your keyboard notes, although an octave or so are reserved as key triggers to switch between a selection of different preset step-sequencer patterns. If those patterns don't do the trick, you can quickly edit any of them through the Kontakt Player GUI, not only changing the controller values for each step, but also the tempo-related rate at which the steps trundle by. All this means that each loop can generate umpteen variations and fills to give a less repetitive and more organic feel to the final result that belies the simplicity of the 16-step setup. Those of you after more industrial soundscapes will be pleased to know that plenty of patches here appear to have involved letting a drummer loose in a medium-sized branch of B&Q, so if you fancy recreating Stomp without all those sweaty percussionists, here's your chance! 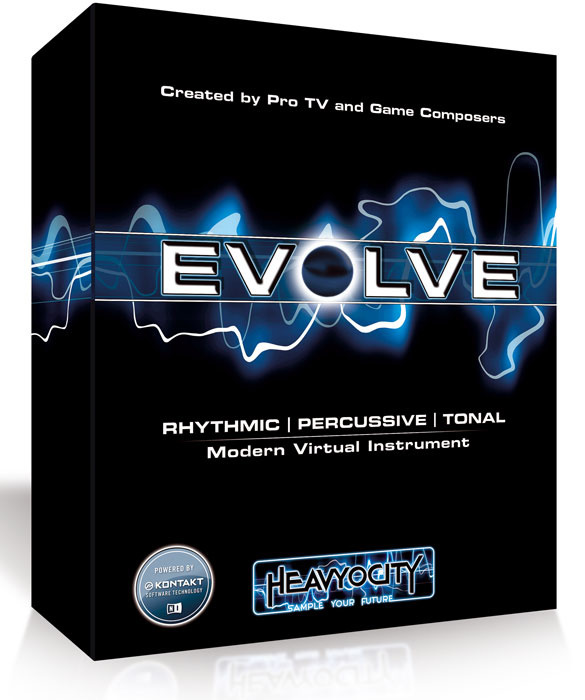 Although Evolve as a whole definitely lends itself most readily to darker and edgier scores, there are a handful of sounds that buck this trend, most of them cropping up amongst the Percussive Kits. The Comedy Kit, for example, furnishes you with the resources to terrorise Daffy Duck with an army of Swanee whistles and bicycle horns, while the Beat Box Kit will doubtless remain evergreen in the land of light-hearted snackfood commercials. And, of course, let us not forget the Brown Air Kit, a set of flatulent one-shots performed with what one can only assume is gusto... A few other middle-of-the-road percussion options (tambourines, shakers, ethnic drums) will doubtless be useful in practice, but through no fault of their own these ended up feeling a bit uninspiring against the more creative fare surrounding it. Where appropriate, the samples in these kits are laid out as in the Looped Percussives patches, although occasional samples are assigned across several keys to allow some pitch variation. I'd have liked a bit more control in this regard, though, to be honest, and some kind of per-key pitch parameter within each patch would have made the one-shot kits more adaptable to unforeseen circumstances. Still, this (and much more besides) will be possible if you have the full version of Kontakt 2 or 3, into which the library will also load. Stings & Transitions is a wide-ranging collection of sounds designed to draw attention to hitpoints in on-screen footage, as well as to point up the structural boundaries between musical sections in general. These kinds of sounds typically have a slow start to them, and often evolve towards the hitpoint, introducing extra momentum. Probably the most well-known example of this kind of sound is the GM soundset's reverse cymbal, and while Heavyocity certainly don't leave that box unticked, that's only the start of what's available here. The 16-step sequencer for arpeggiated sounds in the Rhythmic Suites family has independent controller setups for note velocity, pan and filter cutoff. These three-way setups can then be switched using MIDI keyswitches, for lots of quick variations on a given basic patch.Given that many transition effects are about promoting suspense and tension, it's no surprise to find that there's a great deal of very creepy material on offer: demonic roars and inhalations, distant Godzillas, eerie data transmissions from the outer reaches of space, approaching swarms of blood-sucking locusts, undersea metallic collisions... it just goes on and on. What is evident throughout Evolve, but most striking here, is simply how powerfully evocative this stuff is — no messing around, you just dial up a patch, hit a few keys and you're instantly on a wide-screen emotional rollercoaster. The more static and mood-setting Stings are just as good, transporting you between arctic wastes, shimmering deserts and desolate moons in the blink of an eye. However, the stand-out patches in this family, for me, were in the Uncaged Piano group, where Heavyocity seem to have done almost everything physically possible to a piano without actually playing it properly! As such it's a towering monument to shocker clichés, and should reliably give anyone of a nervous disposition a serious case of the willies. The pads are more consistent in their appeal, featuring fantastic atonal string tremolo and 'singing wineglasses' patches amongst a broad selection of gently rippling atmospherics of different flavours. The phrase samples have some hidden gems too, including the best collection of violin special effects I've yet come across (woozy slides, scuttling clacks and various unsettling meanderings besides) and a large selection of operatic vocal phrases (complemented by some well-aimed multisamples) that could be no less than spine-tingling in the right context. The vocal chants are also fun — think pentagrams and headless chickens and you'll get the idea — and I'm fairly sure that the supplied handful of belligerent shouted syllables will adorn many an epic battle scene in the years to come. Can you tell that I like this library? 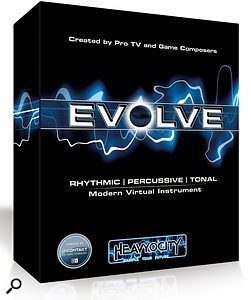 It's not just that the sounds are good and that they're targeted with laser-guided accuracy at the more difficult-to-score and abstract genres, it's also that Heavyocity seem to have made the instrument specifically with the looming shadow of production deadlines in mind, designing it to deliver finished results in good time for yesterday's pitch. The Kontakt Player interface has been intelligently used to provide a mostly well-judged subset of parameters for common tweaking requirements (envelope controls, filter settings, effect levels), and you are, of course, at liberty to add further effects and processing within the instrument's mixer. The bottom line is that this is a killer instrument which it would be madness to ignore if you're interested in creating music for picture. However, the applications of Evolve in other general music work are also legion, as I've been discovering recently in my mixing work. Mixes that are lacking flashes of drama or a sense of atmosphere (a common problem in programmed or heavily-overdubbed music styles) can be quickly and easily enhanced in these departments, making them cinematic and larger than life. I can see this instrument being perfect for gothic-tinged rock styles in particular, while trance and chill-out producers could certainly benefit from the more ambient elements. Other electronica and urban artists may also want to check out Evolve as a means of pulling their programmed tracks together and improving mix dynamics. Something to reiterate, though, is that Evolve isn't a one-stop-shop instrument — for the purposes of most music composition, you're going to need a selection of other sound sources to provide the bread, butter and Spam of your musical sandwich. However, if you've already got those basics sorted then this library could easily be that magical element (the whole-grain mustard, perhaps, to over-extend my analogy) that transforms your music into something that really sounds like it belongs on the screen. It really is that good. There are a lot of film sound-effect collections out there, but with not nearly as much material of a 'musical' slant as Evolve. 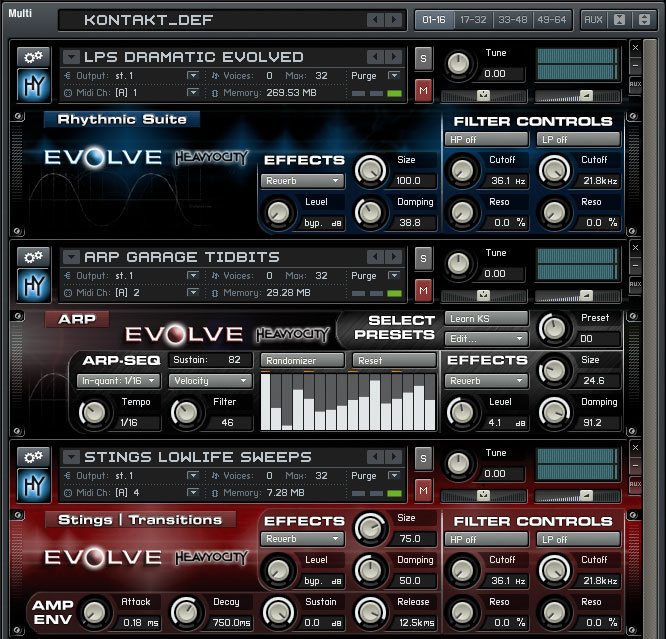 Sample Logic's The Elements is another possibility in Kontakt Player form. John Walden reviewed this back in the February 2008 issue of SOS, and at £169 it boasts a generous 14GB soundset that John found easy to navigate and use in practice. I have to say, though, that although I've not had my hands on The Elements myself for direct comparison, I did find the MP3 demos a little uninspiring next to those from Heavyocity. More impressive-sounding to me were the demos for Ueberschall's Liquid Score FX, a 7GB library retailing at £115, and the flexible time-stretching and pitch-shifting of Ueberschall's bespoke Melodyne-powered instrument is likely to make these much more widely usable than might be expected of a normal phrase library. However, for sheer quality of sounds and immediacy of use, Evolve competes strongly with both of these titles on account of its speed in use and the sheer quality of its sounds. Packed with evocative sounds accurately targeted at numerous modern film-scoring styles, especially the more abstract suspense genres that tend to present many more sound-design challenges. Considering how difficult it is to describe many of these sounds, Heavyocity have made it surprisingly easy to find what you're looking for. A few control limitations when using the library with Kontakt Player, although not when running in the full version of Kontakt 2 or 3. A fantastic sound-design resource for giving your music a professional cinematic sound. Quick to use, and with lots of material, this will deservedly find a place on many budding media composers' wish-lists.